Hola AIESEC in South Tangerang 2019! condition. Everything you do in this organization is huge contribution, as the president I feel so glad having you guys as my member. This event is all about how we can gain our performance and be stronger as an AIESEC-er. I hope you can get more and more in this Local Summit and use this as your platform to learn. AIESEC is a jungle, you will get nothing except you come and take it by yourselves. It’s a joyful for us to presenting you the first summit in our Local Committee AIESEC in South Tangerang, Local Summit Best 1.0. It’s a very delightful event that you cant be missed, because you will have a lot of things in here! In this booklet, you will see all of thing about our conference. So, prepare yourself starts from now on because it’s gonna be worth it. We guarantee that you cant be regret to join, because it will be driving your conference experience and boosting your performance. Also, there’s such a moment that can build up your feeling as AIESEC South Tangerang’s family. It’s such a promising, right? I L are youEwaitingAfor? DontDmiss a chance to register So, what yourself. See you in there! W hat is Local Summit BEST 1.0? 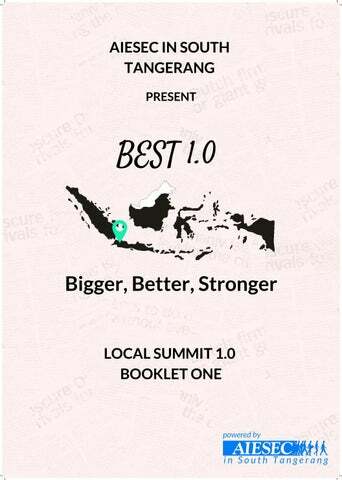 BEST is Local Summit Annual Event held by AIESEC in South Tangerang that only exclusive for member of AIESEC in South Tangerang and Committee from AIESEC in South Tangerang Projects. BEST is stand for Bigger, Better, Stronger. The purpose of Local Summit BEST 1.0 is to provide members of AIESEC in South Tangerang to enhance their professional skills, provide networking opportunities, and work on organizational strategy together. This event will boosting a conference experience that member never had before. 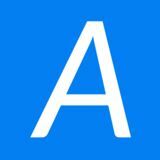 Local Summit BEST 1.0 will be held on 27-28 April 2019, Venue soon to be announced.